Does this look all too familiar? Has your garage become disorganized and a bit messy or has it turned into your own private black hole where tools, gadgets, and possessions seem to get sucked in only to never see them again? If you’re rolling your eyes and shaking your head yes right now, then you know it’s time to quit putting it off and make a plan to get your garage organized and cleaned up. Everyone who owns a home would like to have a nice functional garage floor to be proud of. But before you can install your favorite garage flooring system, it may be necessary to get your garage in a more orderly condition first. Many times the hardest part of getting your garage organized is figuring out how to get started. Well do not fret! We found an excellent article below that maps-out a great plan of attack for organizing your garage in a series of days instead of trying to figure it all out in 1 day or a quick weekend. It covers how to purge items, declutter, categorize, and clean, as well as smart ways to use the various organizing and storage systems that are offered today. Once you get your plan figured out, the next step is to take advantage of the many garage organization tips that are available. From storage bins to shelves, this article below will surely give you good ideas for how to arrange and store your garage belongings.
. These are a great addition to the typical wall cabinets and shelves. You may be surprised how much stuff you can get up off the floor with these. They mount solidly to the overhead and are designed to carry hundreds of pounds. Most of these are a fairly easy DIY installation as well. Just be sure to leave room for overhead lighting in the future if you haven’t planned for it already. 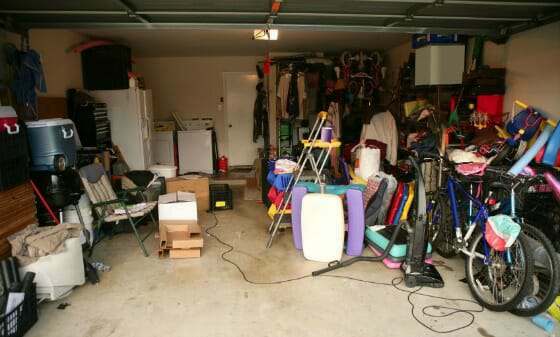 Remember that the best opportunity to get your garage floor cleaned is when you have everything pulled out. It’s also a great time to inspect your floor for any damage or repairs that need to be made as well. And what you find in your floor inspection may help to determine what choice of garage flooring that you decide on. Organizing your garage doesn’t have to be so tedious if you plan it out ahead of time. Heck, it can even be fun. Have trash cans at the ready and a vehicle set to make runs to the local charity if necessary. Be sure to enlist some help if you can and be realistic about what you really need to keep. The best part is that once you get your garage organized, it’s much easier to keep it that way with only a little bit of upkeep. Thank you for your post. 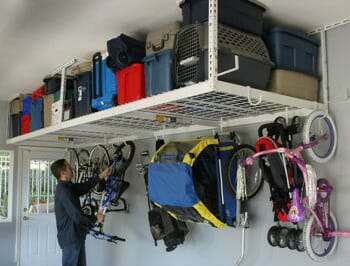 Our business specializes in strong garage organizers (and closet organizers) that are the easiest to install. Please check us out for fast, strong garage organization.